Carolyn Schlam is an award winning American painter, sculptor and glass artist born and raised in New York City. She studied painting with Norman Raeben, youngest son of the Yiddish writer Sholem Alecheim, in Carnegie Hall Studios, and glass-making at Urban Glass in Brooklyn. She is currently an artist-in-residence at Studio Channel Islands in Camarillo, California where she continues in the pursuit of her passion—painting in oil, drawing from life, and crafting confections of glass and other media. Carolyn is also a published author. Her book, “The Creative Path: A View from the Studio on the Making of Art,” is a treatise on art making from philosophical, psychological, practical and spiritual points of view and was published in 2018 by Skyhorse Publishing. Her latest book, tentatively titled “The Joy of Art” is an art appreciation course from the artist’s lens, and will be released by Skyhorse in 2019. Carolyn’s books for children, “Art Smarts: A Primer for the Young Artist” and “The Alphabet Club” are available through her studio. She will soon begin work on a book showcasing contemporary women artists. In 2013, Carolyn was named one of the 48 finalists in the Smithsonian Museum Portrait Competition. 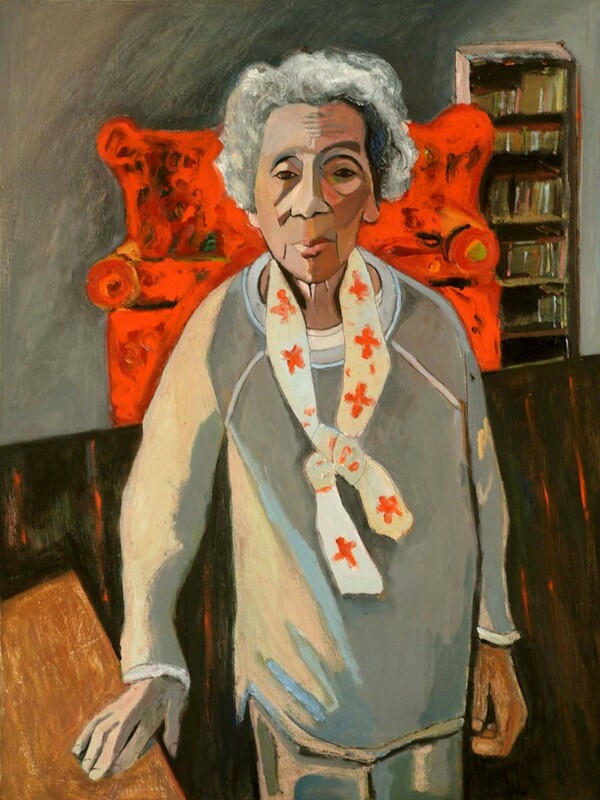 Her portrait, “Frances at 103” was exhibited in the National Portrait Gallery for one year and was subsequently acquired by the Museum. It is in the permanent collection of the Smithsonian Museum of African American History and Culture. In 2018, her “Mother and Child” joined the prestigious Cedars Sinai Art Collection. Carolyn has a strong interest in donating works to organizations and collections, especially those with a feminist orientation, and encourages interested parties to contact her. Carolyn Schlam’s portraiture is infused with emotional content, expressing the vulnerability and longing of her mostly female subjects. She explores portraiture in its many aspects– traditional, in which appearance and character are foremost; expressionistic, in which the inner life is heightened; and stylized, in which the image becomes iconic. She is known for her use of exuberant color, elegant drawing and modern design.